It's rare for a person to remember exactly where he or she was at a single moment in time, some four decades later. It's rarer still for an entire nation to hold a collective memory of such a moment. This kind of hardwired retention usually results from group trauma -- the shock of assassination, large scale tragedy, or natural disaster. Occasionally, the event that galvanizes a population is a happy one. Such was the case when Paul Henderson scored the memorable goal in '72, that won the game and united Canada. The Goal that United Canada contains 72 stories that revolve around the '72 Summit Series between Canada and the Soviet Union. Viewed separately, they are very personal, even intimate in nature. When they are strung together they begin to tell a larger story, a uniquely Canadian story of love for our country and its game. Hockey is often the focal point of the Canadian narrative. Author Sean Mitton found that out himself when he moved to North Carolina and founded the Canadian Expat Network website. Hockey united Canadians abroad, and often it was 1972 that dominated the discussion. Mitton then got the idea of collecting people's stories and compiling them into a book for the 40th anniversary of the 1972 Summit Series. He claims he wasn't sure if he was crazy for undertaking this project. Deep down, he knew this project would succeed since he was three years old. Mitton was just 3 in 1972 and has no direct memory of the series. But his mother - a non-hockey fan at that - was moved to extraordinary measures. The story would be re-told throughout the years, triggering her son's insatiable curiosity about this amazing event. And over all the years he learned that almost everyone in Canada was someone how touched by the eight game hockey series in many different ways. So Mitton, and co-author Jim Prime, set out interviewing Canadians from many walks of life. In their collection of stories they try to show not just the tried and true typical 1972 story, but the many layers beneath it. Some of Canada's most recognizable names are included among the 72 stories - Peter Mansbridge, Walter Gretzky, Don Cherry, Denis Brodeur, Bob Cole, Greg Keelor and Jim Cuddy of Blue Rodeo, Howie Meeker, Darryl Sittler, Johnny Bower. The book even features Paul Henderson himself, telling the story of how his goal actually saved a marriage. But they also include everyday Canadians - including some of the 3000 fans who travelled to Moscow with Team Canada. Others who were working in hospitals, or parked at a shopping mall in the United States or walking home across a deserted campus. Oh yeah, the stereotypical story of watching the game in the gymnasium of a school is included, too. 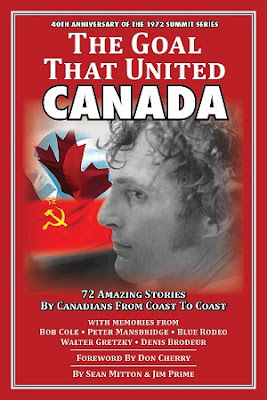 But by and large this is a completely entertaining collection of fun and at times bizarre stories that shines a whole new light on just how deeply Paul Henderson's heroics and the 1972 Summit Series affected Canadians.